On March 27, 2018, at 6:00 p.m., a recognition ceremony was held in the Donald A. Stafford Media Conference room honoring all the Shining Star recipients. The Shining Star Award honors both sworn and non-sworn members of the department for ethical conduct, individual acts which go beyond the call of duty, or other actions which bring favorable recognition to the Dallas Police Department. In 1995, Mr. Cary M. Maguire began sponsoring the Shining Star Awards for the Dallas Police Department to recognize and honor community members who exemplify the spirit of moral leadership and public virtue. 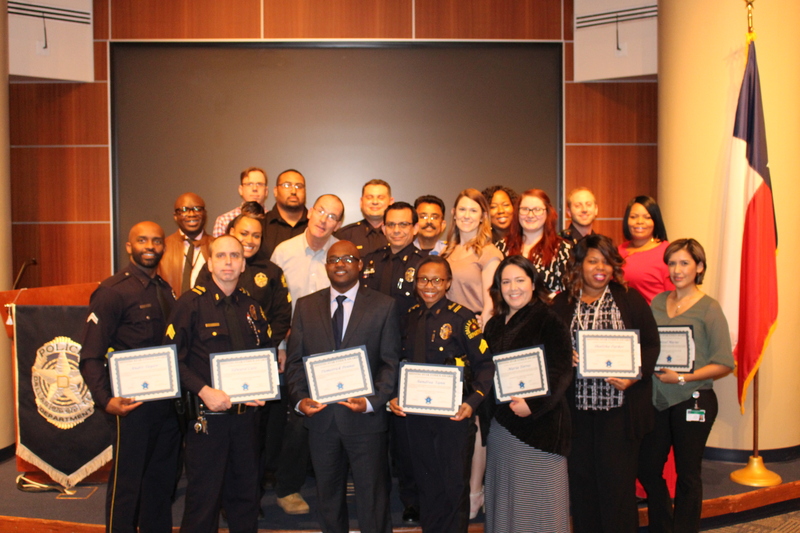 Congratulations to all the recipients of the Shining Star Awards, the following individuals performed exceptional acts of kindness, demonstrating why we continue to strive for excellence in the City of Dallas. Shining Star Certificate Recipients: John Abraham, Oladapo Alli, Timothy Brown, Rebekah Cameron, Sharla Corson, Maria Davila, Shanna Ellison, Dorine Painter-Fernandez, Samuel Hanson, Osama Ismail, Donavan Johnson, Rachel Jones, Megan Knowles, Sissel Macias, Micheal Nealey, Jared Pomponio, Joe Ramos Jr., Joseph Reyes, Martha Salinas, Kevin Scahill, Petra Tamez, Andre Taylor, Maria Torres, Aundrea Vann, and Joanne Wilson.